The Pathfinder RPG began life as a product catering to established gamers—those who wanted to keep playing Dungeons & Dragons 3.5 while WOTC pushed 4th Edition. In that sense, it has been wildly successful, with some reporting that its sales exceed those of D&D. Now though, it appears its time for Pathfinder to grow up, settle down, and start raising children. 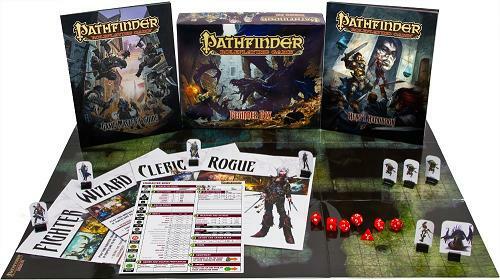 In an effort to recruit new gamers, Paizo has released the Pathfinder RPG Beginner Box. It’s a boxed game with a slightly simplified and abbreviated rule set, and all the components needed to play, including separate player and game master books, dice, standup cardboard tokens, character sheets (blank and with pregenerated characters), and a Flip-Mat play surface.